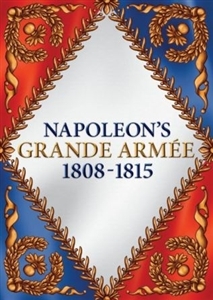 Siegeworks Studios – Napoleon’s Grand Armee – Grand Battles Napoleon Supplementfrom Australia’s own Drew BirkmyreNow you can design your own French Grande Armée using the army lists in this Grand Battles Napoleon supplement. Build Lannes 2nd Corps in 1809, Davout’s 1st Corps in 1812 or Marmont’s 4th Corps in 1813. Recruit famous French leaders like Napoleon, Ney, Nansouty, Massena and Soult to lead your brave army. The lists are based on historically flexible divisions of the day and allow players to field French Conscripts, Veterans, Foreign and Marine regiments, Chasseurs, Hussars, Dragoons, and Cuirassiers as well as foot and horse batteries and divisions of the Imperial Guard for really big battles! There is also the ability to build the forgotten French armies of La Vendee Royalists from 1793-1815! Bon Chance! “Vive L’Empereur!”Written in Australia – 68 Pages, full colour.